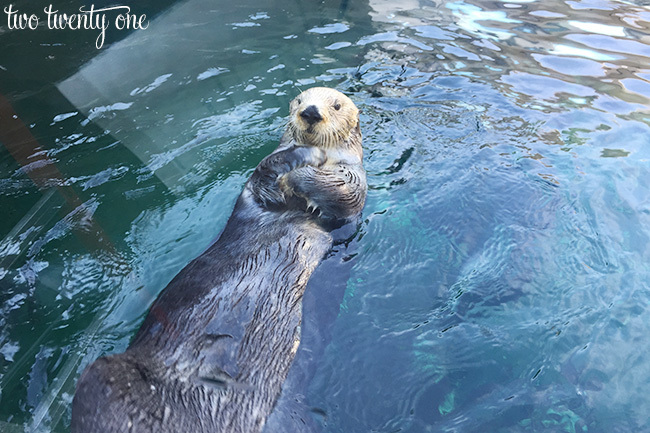 Last month, we went on a 7-day Alaskan cruise with Brad’s extended family. The cruise set sail from Seattle so we decided to go out a couple days early so we could explore the city since neither of us had ever been. Since we were only going to be in Seattle for 48 hours, I mapped out our itinerary before we left. So keep in mind that everything in this post was accomplished in 2 days with a 10 month old in tow. Our flight landed at 10:30AM on Sunday. We got to our hotel, the Waterfront Marriott, around 11:30AM, checked in, and headed up to Pike Place Market to check it out and to grab some lunch. 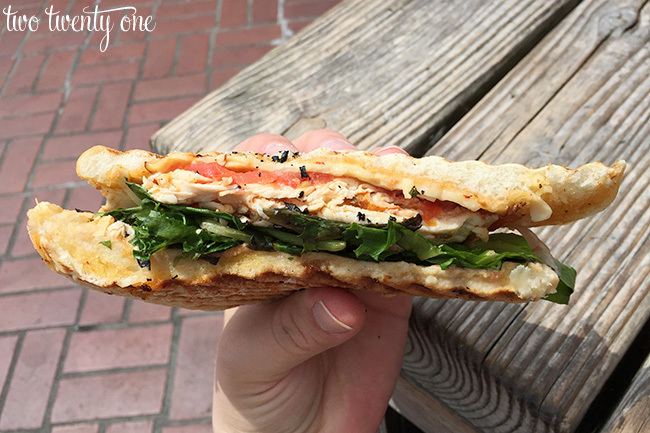 We ate some yummy sandwiches from Michou Deli. 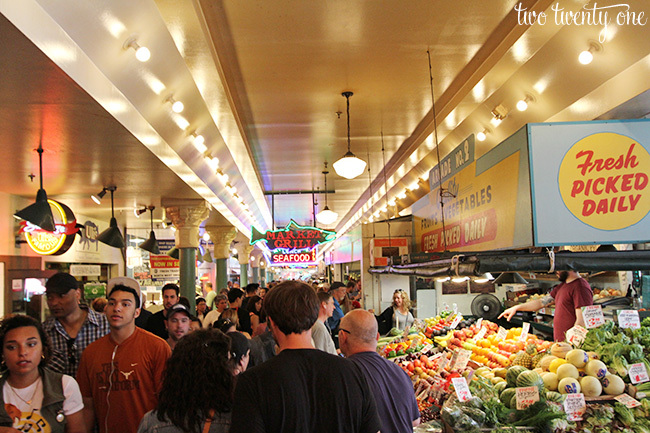 Since it was Sunday, the market was bustling with people. If you’re not a fan of being shoulder to shoulder with a lot of people, I recommend going to the market in the morning when it’s less busy. It was fun to walk through the market and see all the vendors. The fresh flowers were my favorite. I loved watching the vendors arrange bouquets. And the bouquets are so inexpensive. I’m talking big bouquets for $10-$20. 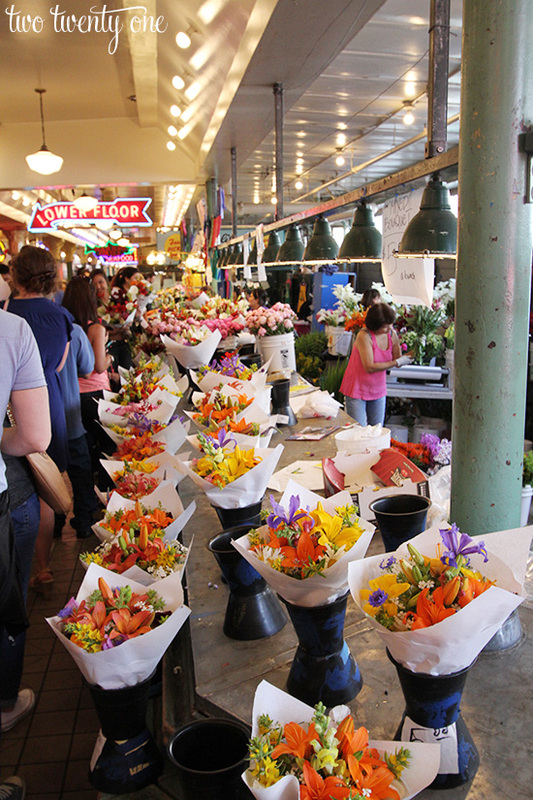 If I lived in Seattle, I’d be down at the market every week getting flowers for my house. 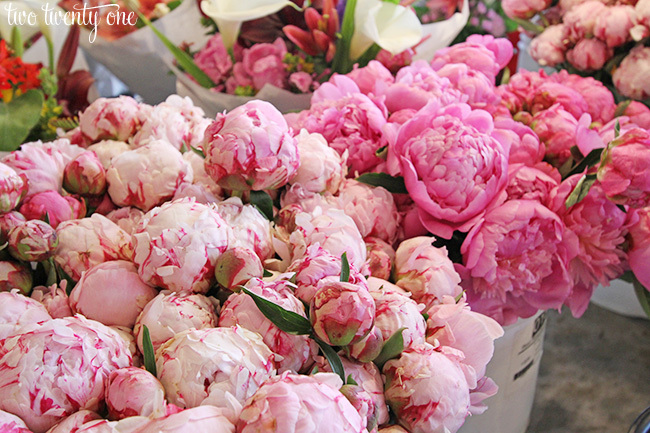 I was in peony heaven. Brad bought me a bouquet to take on the ship for our wedding 4th wedding anniversary, which we celebrated on the third day of the cruise. The bouquet held up really well and was still going strong when we disembarked the ship a week later. 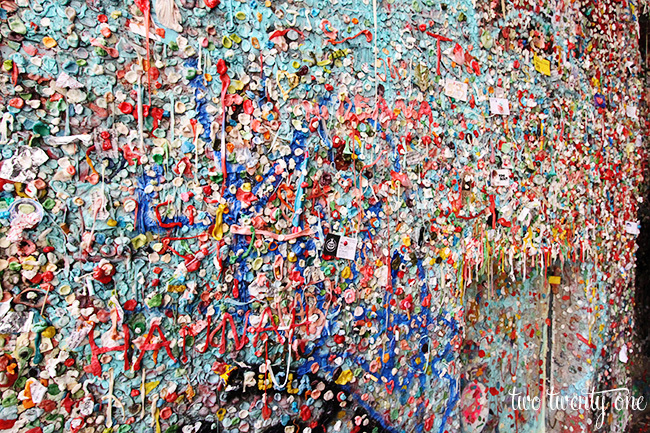 We also checked out the Gum Wall under Pike Place Market. It’s disgustingly beautiful. 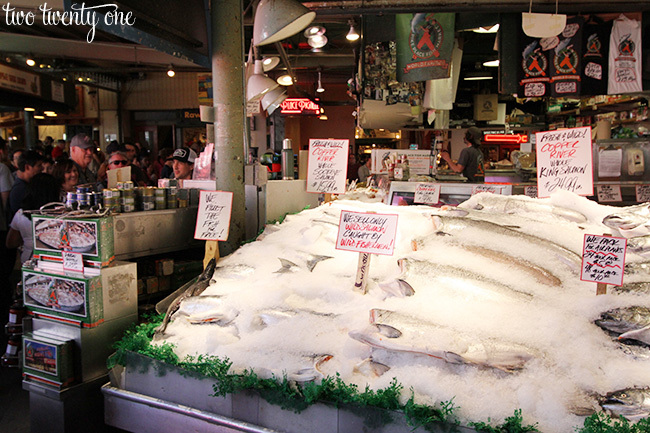 The next morning, we woke up early and headed up to Pike Place for breakfast. 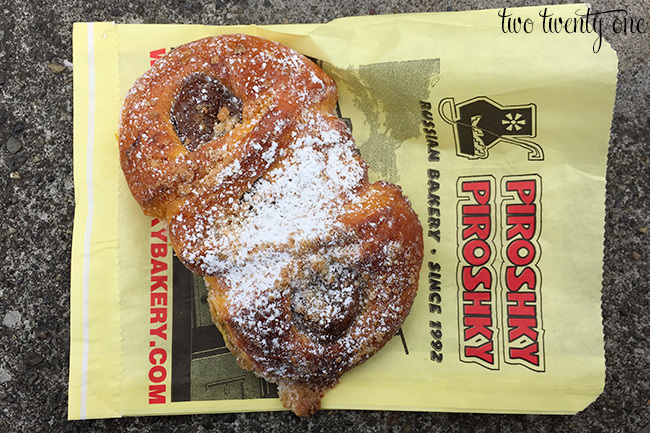 On Sunday, we had seen a big line for Piroshky Piroshky, a Russian bakery, so we knew we needed to try it out, sans the long line. We walked right up and ordered a egg, spinach, and cheese piroshky and chocolate cream hazelnut roll. Both were delicious. So much that we grabbed breakfast there the next morning, too. Brad loves Nutella so he was a big fan of the chocolate cream hazelnut roll. After eating our piroshkies, we hiked it over to Seattle Center. It was a one mile walk, but there’s a monorail you can take from just north of Pike Place to Seattle Center. We bought CityPASSes, which I highly recommend. For $69 per person, you get admission to various attractions. 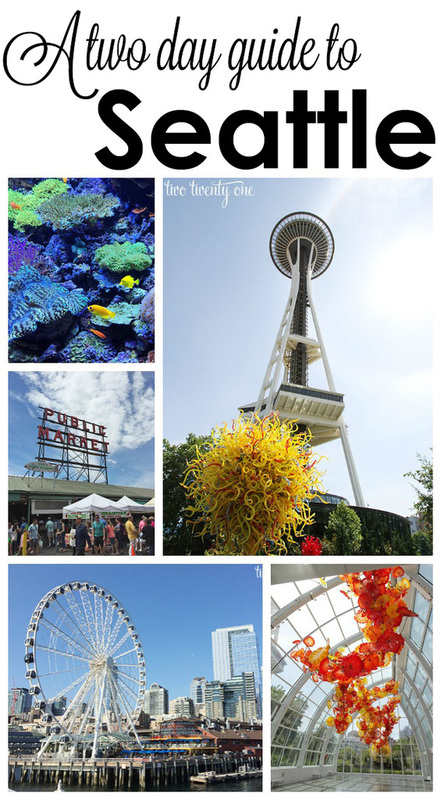 We used our CityPASSes to visit the Space Needle, Chihuly Garden and Glass, EMP Museum, Argosy Cruises Harbor Tour, and Seattle Aquarium. One nice thing about the CityPASS is that you can go up in the Space Needle twice in a 24 hour period. So you can go up during the day and again at night when the city is lit up. We weren’t able to go up at night because it didn’t get dark until 10PM and Owen is fast asleep by then. I recommend getting to the Space Needle early, because the line can get crazy. If you don’t want to go up first thing in the morning, you can cash in your CityPASS ticket and get a ticket for the time you’d like to go up. So if you get there at 9AM, you can ask for a ticket to go up at 11AM and for another ticket to go up at 10PM. We loved how interactive the Space Needle is. 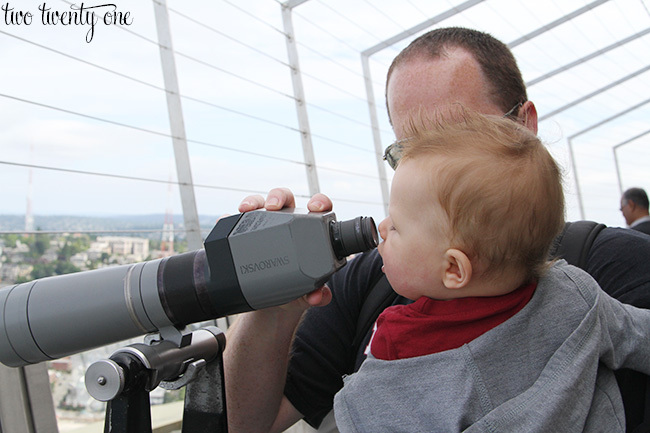 They have telescopes on the outside observation deck and inside they have a bunch of touch screens to explore. 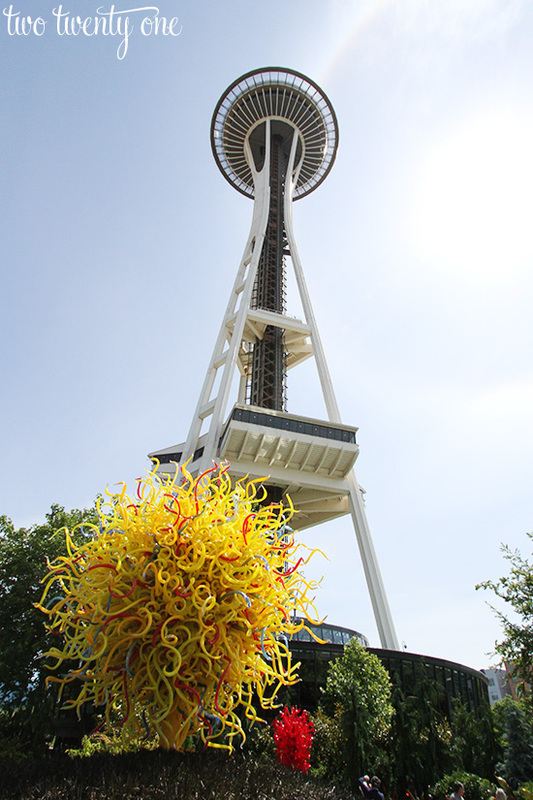 After spending about 45 minutes at the Space Needle, we headed down to check out the Chihuly Garden and Glass. I was was really excited about this exhibit because I used to make fused glass jewelry so glass is intriguing to me. 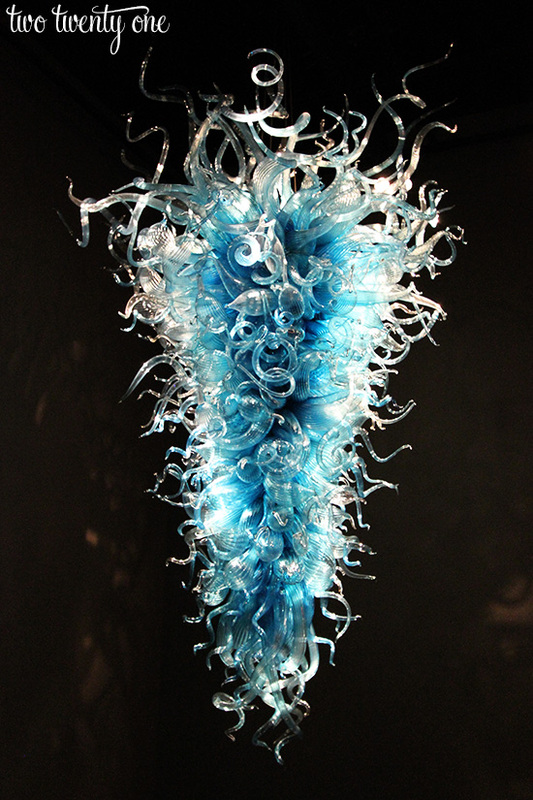 Plus, I watched a documentary on Dale Chihuly last year. The Glasshouse is breathtaking. 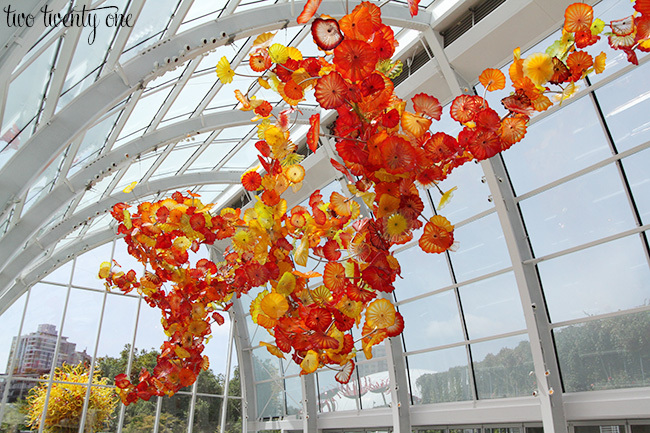 It’s a 100-foot long, 40-foot tall glass and steel structure. 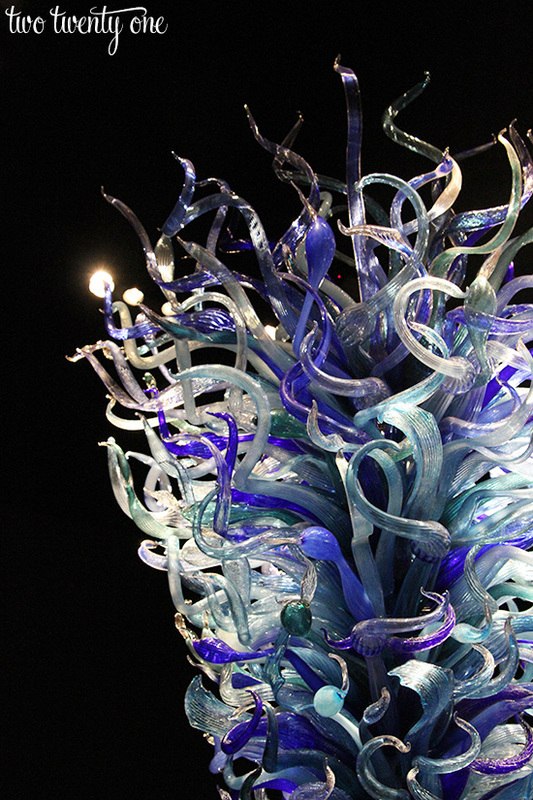 Like with the CityPASS for the Space Needle, you can come back to the Chihuly exhibit at night, which they light up. And from photos I’ve seen, it looks beautiful. The garden is really cool too. I loved the black grass they used in the landscaping. 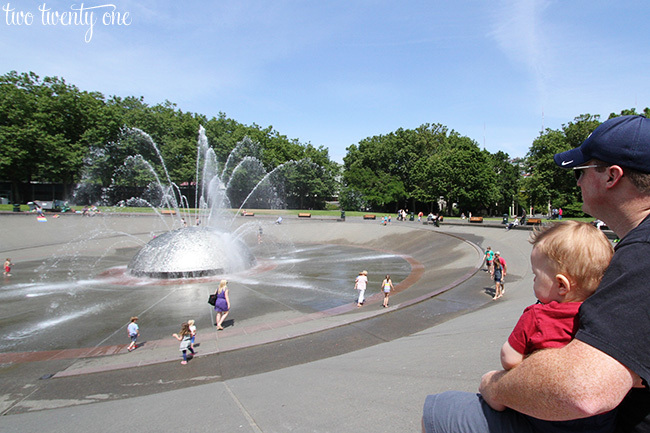 We also checked out the International Fountain in Seattle Center. After grabbing something to eat in the Armory, we headed to the EMP Museum. 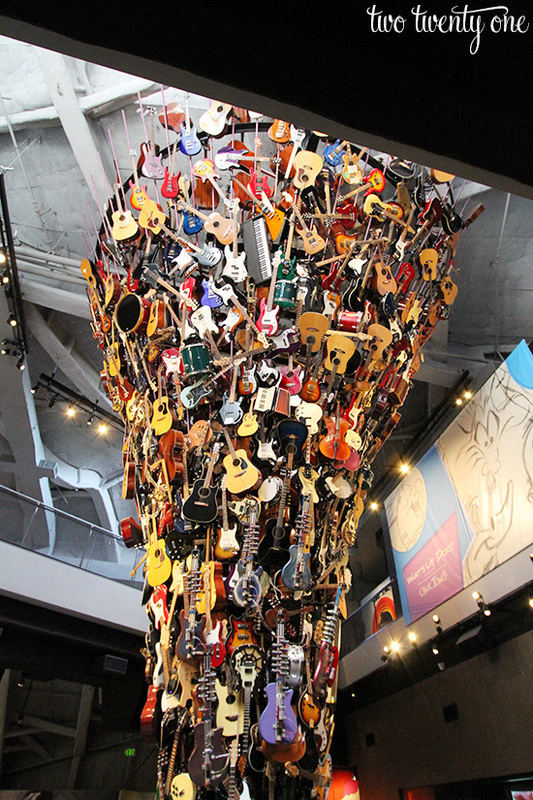 Brad enjoyed the Guitar Gallery and Nirvana exhibits. And I loved the Fantasy exhibit. Hello, they have the Wicked Witch of the West’s hat, David Bowie’s outfit from The Labryinth, and a couple costumes from Game of Thrones. We took the monorail back and headed to our hotel to relax for a little bit before heading down to the waterfront to take an hour-long harbor tour. The tour was very informative, and we got to see great views of the city. 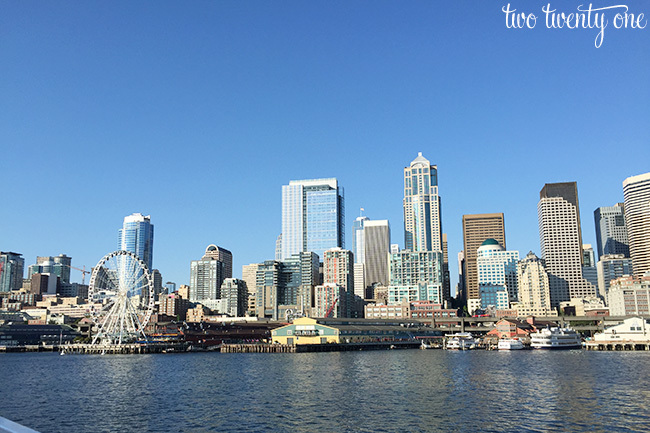 On Tuesday morning, we woke up, grabbed breakfast at Piroshky Piroshky (again), and then headed to the Seattle Aquarium. We got there about a half hour after it opened so it wasn’t very busy. 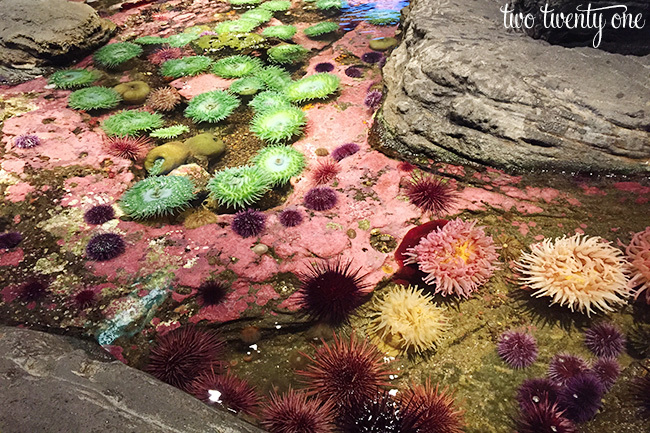 They have a handful of touch pools, where you can see and touch the sea life of Puget Sound tide pools. 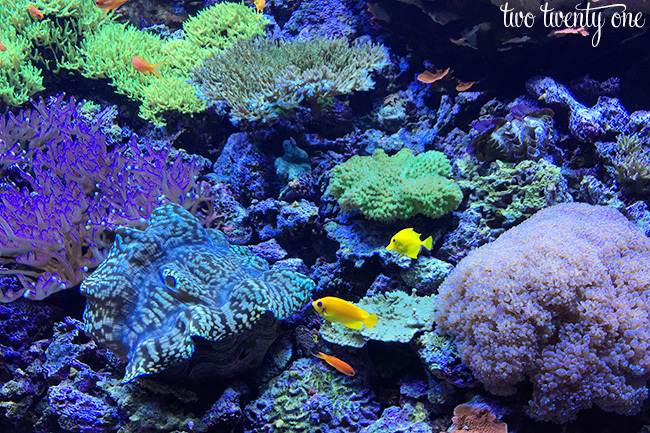 I haven’t been to a lot of aquariums, but I thought this one was great. 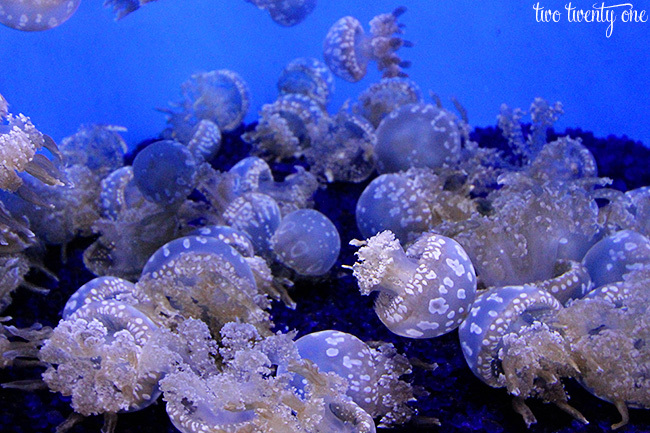 They have tons of beautiful exhibits and an array of sea life. 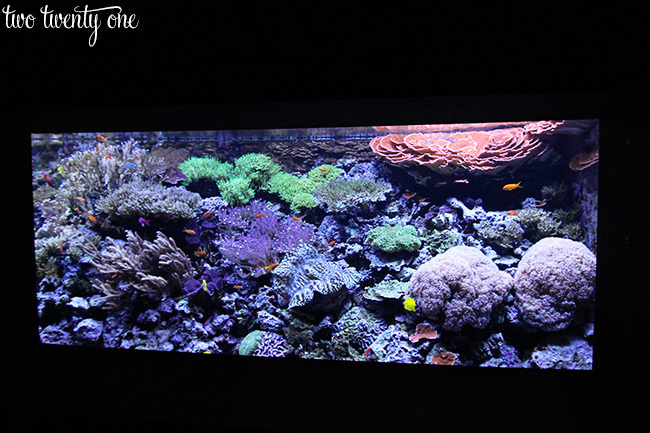 We spent about an hour and a half at the aquarium before heading back to our hotel to check out and head to the ship. In case you travel to Seattle with a baby or toddler in tow, I thought I’d clue you in on the best way to tote your babe around. 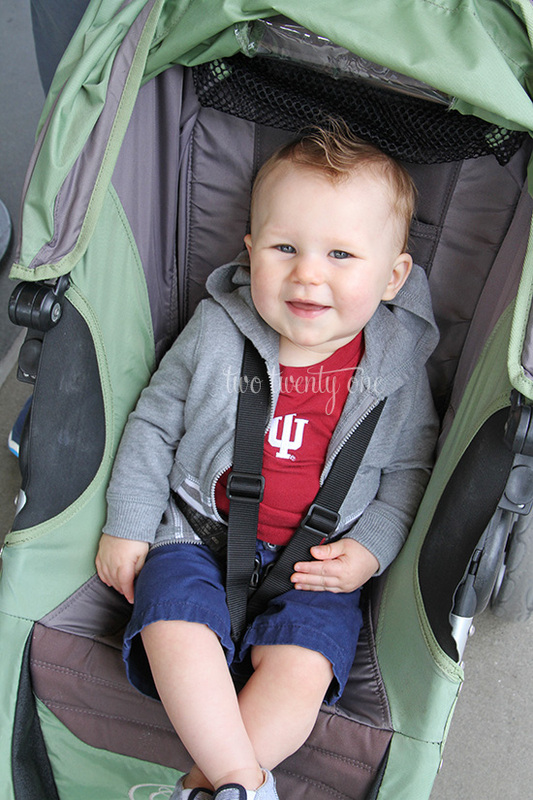 We love this stroller for travel because it collapses easily and compactly. And we love this baby carrier for a multitude of reasons. 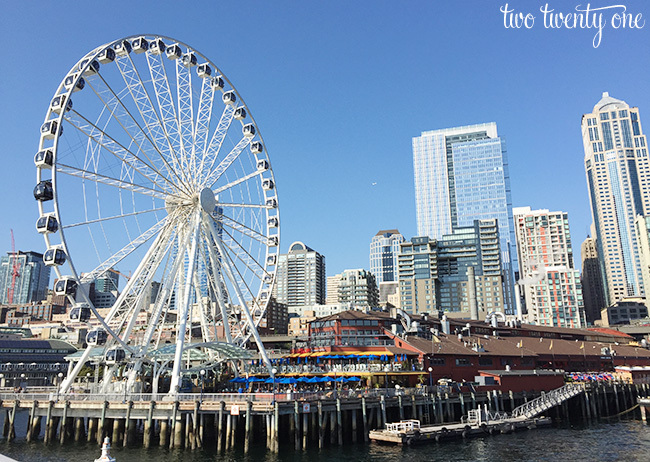 We really enjoyed our time in Seattle, and we’d love to go back again someday to see more! I’m so impressed with how much you did in two days with a toddler! Seattle is definitely on my list and my sister lives in Vancouver so I hope to plan a combo trip soon! Thanks for all the tips with strollers! Hah! Me too. 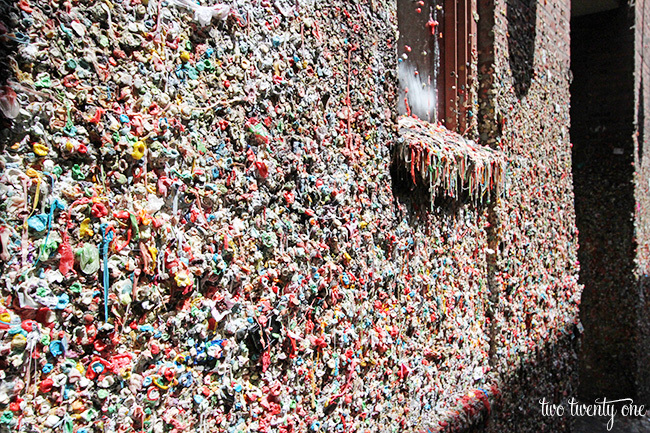 Definitely hit up Seattle the next time you’re out there! You read my mind! Heading to Seattle for the first time on Thursday and we’ve got about 2.5 full days to spend exploring! We bought the City Pass so this was beyond perfect to hear how you used them! Thanks! Yay! You’ll have a great time! I also highly recommend the Underground tour in Seattle. It was crazy how much history we learned, and it was really cool to see the old buildings still in tact underneath the new Seattle. Yes! I’ve heard great things about that tour. Unfortunately, we didn’t have time to do it. Russian bakery is the best! :))) My grandma was a baker, and I miss her piroshki so much! 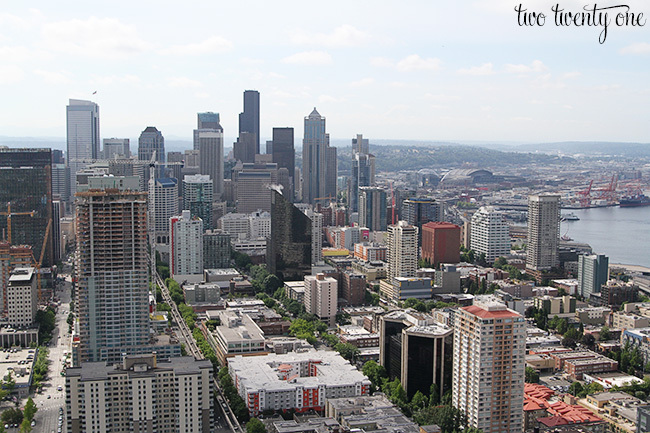 You’ve got some nice pictures of Seattle! I love that you guys did so much in 2 days! Looks like such a fun two days! I would totally be all about that chocolate hazelnut deliciousness, and the flowers are just stunning! It was! Right? 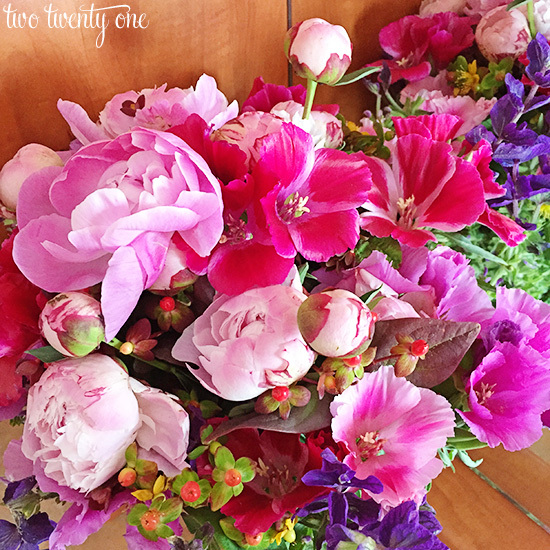 I need a flower market here in Indy– and for those prices! I’m glad you liked my adopted city. I’ve lived here for 35 years. 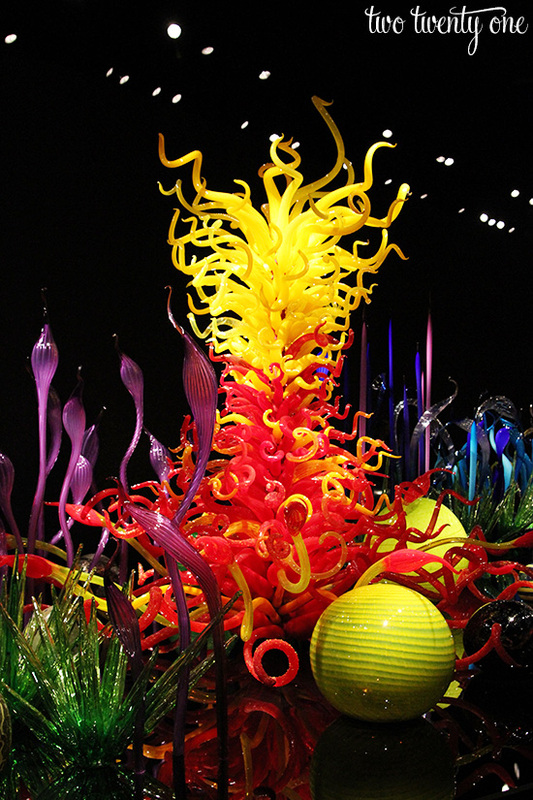 I need to get down to see Chihuly garden!! Thanks for your good review! I love when people visit and enjoy my city! You hit all our favorite spots! 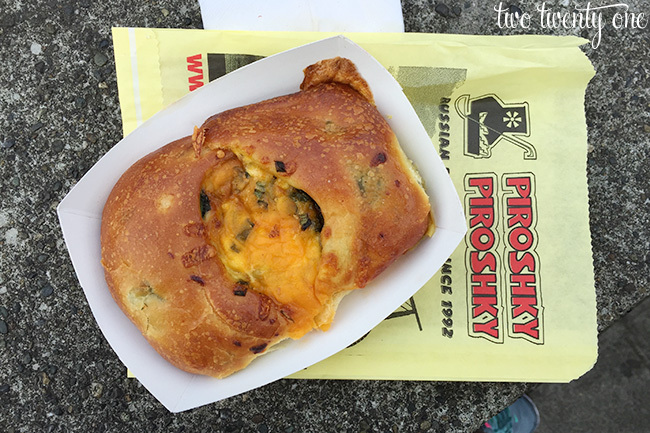 We try to get down to Pike Place Market every couple of weeks, and we love Piroshky Piroshky. The flowers are the best, although we’ve learned to pick them up after we’re done with the rest of our shopping because those huge bouquets are heavy! I’m glad you had a great time! They are quite heavy! You’re lucky to live in such a wonderful city! Thank you for this! I will be in Seattle in September and this was very helpful! Holy Cow you did a great job chronicling a day (or two) in my city! 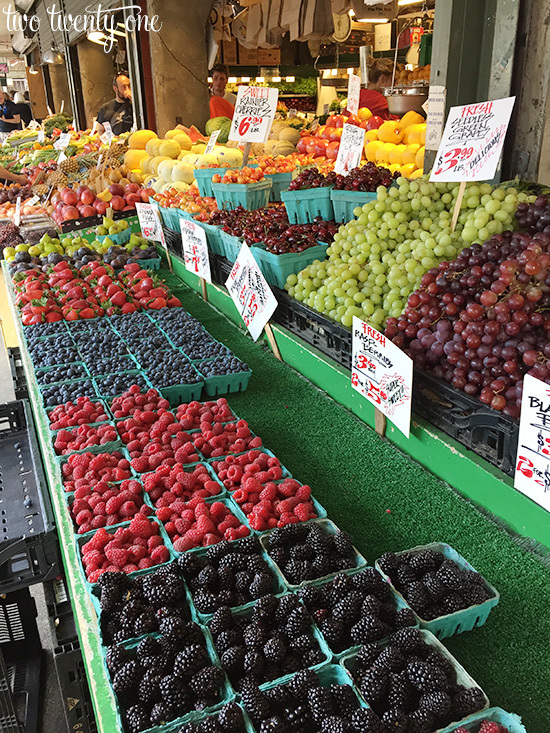 Crowds are so bad at The market in summer…but come back in late fall and winter and it’s pretty nice! 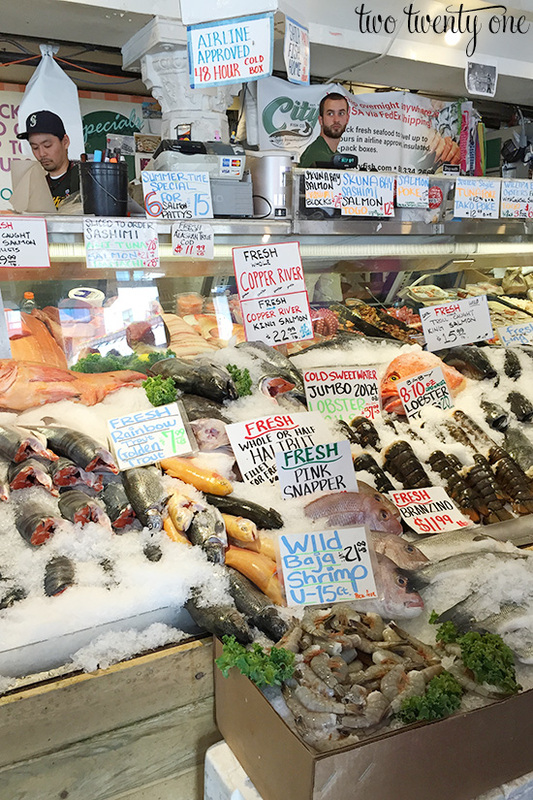 Venture up to Capital Hill and Queen Anne for some amazing dining on your next visit! Lovely post and great pics! 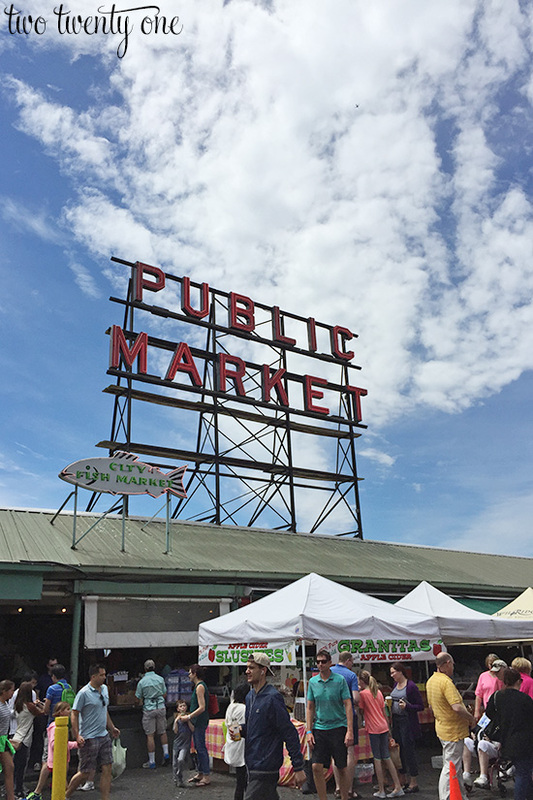 I’m a Seattlite–I’m sitting at my desk job as we speak and I’m less than a mile from the market!–and I’m getting a kick out of your whirlwind weekend here! You guys covered some good ground! Next time you’re around and looking for inexpensive touristy things downtown, there’s a Starbucks on the 40th foor of the Columbia Tower (the tallest building in Seattle) that you can go to for free, the water taxi to West Seattle is like $7 per person and is TOTALLY worth it (not as much tour-guiding as the Harbor Tour, but at least as great of sights! ), and the Underground Tour in Pioneer Square is actually pretty worth it. 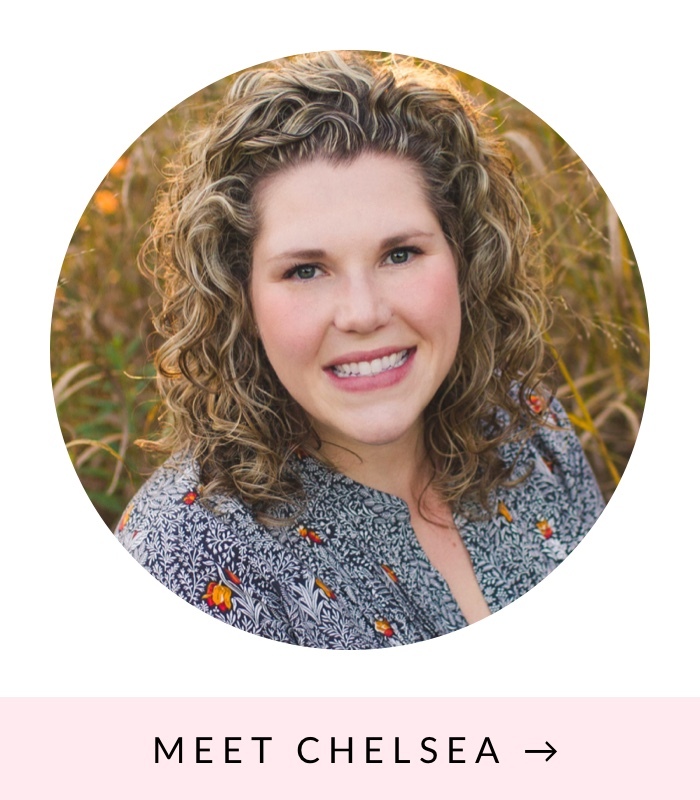 Super pumped now that I know what to do and where to go! Thanks for your insight. 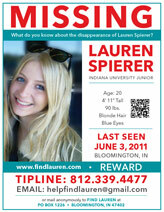 Heading to Seattle Tuesday with my 18-yr old Goddaughter. Your itinerary is really helpful! Tell me, please, were you able to walk to all the attractions from your hotel? Thanks in advance! 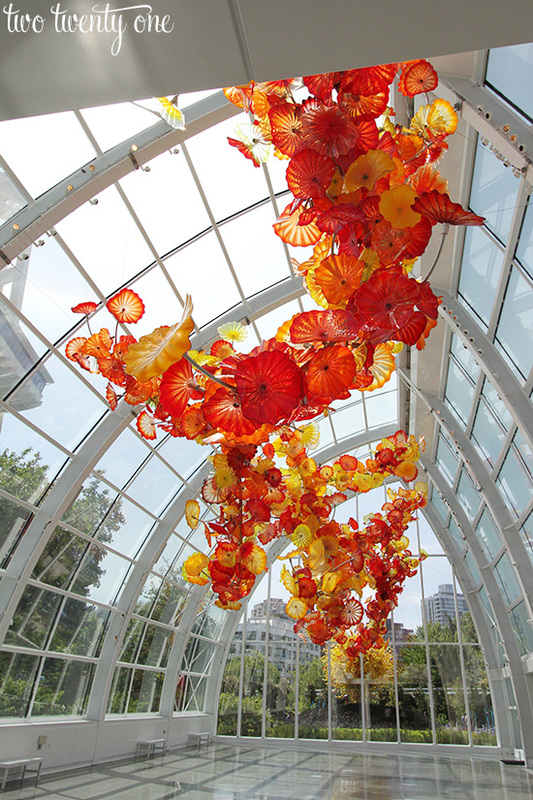 We are heading to Seattle soon and I was bouncing around the internet and found your treasure trove of information. Thank you so much for sharing, I can’t wait to grab my camera and do some shooting in this beautiful city. Thank you for sharing all these helpful tips. We are headed to Seattle next month, so this was so informative! Just got back from Seattle myself and all I have to say is wow! You packed a lot of sightseeing into just two days. 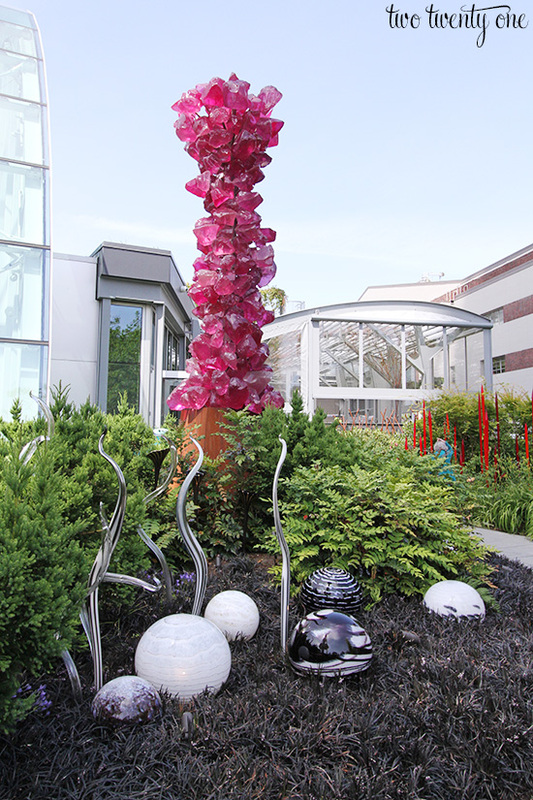 I really enjoyed all the sculptures and art installations around the city, especially through the Olympic Sculpture Park. There was also a Women Painters of Washington Gallery in the Columbia Center that has a nice little display of local artists. I didn’t go to the observation deck there, but I did notice the price is much lowee than the Space Needle.